On one hand, there are thousands of architectural innovations that could be shared, but are used once and lost forever. On the other hand, there are only so many ways to design a building and there’s a lot of reinventing of the wheel. Both of these inefficiencies and missed opportunities have existed for decades. As of March 8, 2007 those problems began to diminish, as architectural design has finally gone open source, and with a triple-bottom-line (3BL) to boot. 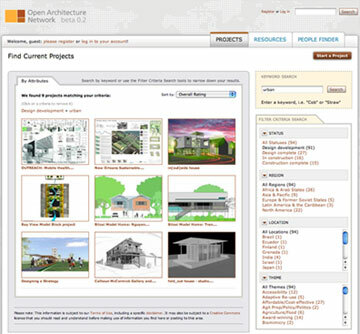 Armed with a $100,000 Technology, Entertainment, Design award (and assistance from Sun Microsystems), Architecture for Humanity, a nonprofit promoting 3BL architectural and design solutions, built what is essentially a Wikipedia/Flickr for architectural innovation (see image). Called the Open Architecture Network, the system provides incentivizes architects to submit their work by offering the equivalent of a global review team to help them improve their innovations for free. Check out Wired for an interview with the founders.